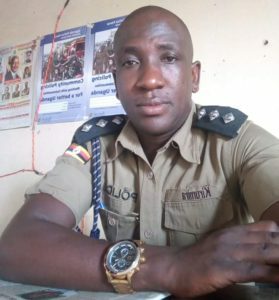 Embattled Buyende DPC Muhammad Kirumira. File photo. Police have Thursday morning forcibly arrested one of their own, Muhammad Kirumira, over comments he made yesterday. This is after Kirumira, who was heading to the Police Court for his hearing, asked the officers for an arrest warrant. “IGP should act professionally by arresting me in a formal way. I won’t accept to be arrested by Kifesi goons,” he said while locked up in his house. Using electric cutters, about 15 police officers from the Flying Squad unit broke into his house and forcefully arrested him. Bullets were fired as locals tried to prevent police from taking him. Kirumira yesterday complained of witch hunt from his bosses and even publicly tendered in his resignation. He said he can’t continue serving in such a police force and would only rethink his decision if there was a total overhaul in police. But police spokesperson Emilian Kayima on Wednesday said Kirumira will have to answer for his statements in the media.